Boron is a micronutrient that is required in very small amounts by vegetable crops and other plants. 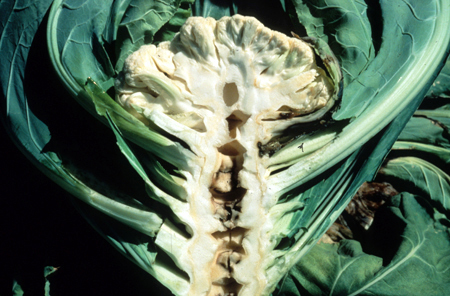 Brassica crops have relatively high boron requirements, and are therefore most susceptible to boron deficiency, though other crops may also be affected. Boron is required for many different aspects of plant cell functioning, including protein synthesis, development of cell walls, carbohydrate metabolism and sugar transport, pollen growth, fruit set, and seed production. Because of boron’s involvement in cell growth, symptoms of boron deficiency are expressed at growing tips of the root or shoot, and generally include stunting and distortion of the growing tip that can lead to tip death, brittle foliage, and yellowing of lower leaf tips. Flowering and fruiting are reduced and developing fruit is often distorted. In brassicas, boron deficiency can cause root crops, especially rutabaga, to develop soft brown centers, a disorder called “brown heart”. Broccoli and cauliflower can develop hollow stems with discolored tissue. Hollow stem is commonly attributed to boron deficiency, however not all cases of hollow stem are caused by boron deficiency - the disorder can be caused by rapid growth due to wide plant spacing, excessive nitrogen or potassium applications, and high soil moisture. Boron applications are not recommended to prevent hollow stem in the field. For more information on hollow stem, click here. Additionally, cauliflower curds may be stunted or turn brown. Boron is most available for uptake by plants in neutral soils, and becomes less available in acidic or alkaline soil. Boron deficiency occurs most frequently in sandy soils with low organic matter content as it is susceptible to leaching, and in soil with low moisture content. Symptoms of boron deficiency will generally begin to appear when available boron in the soil is below 1 ppm, and when boron in tissue is below 20 ppm. Boron toxicity is not common in the east, as our soils have naturally low boron levels and boron leaches easily out of the soil. Symptoms of boron toxicity will appear above 5 ppm available boron in the soil, and above 200 ppm in tissue. Soils deficient in boron can be amended with boron fertilizer such as Borax, boric acid, and Solubor, based on soil tests and crop requirements. In high pH soils, foliar applications are preferred. Once symptoms of boron deficiency are observed, it is usually too late to apply boron. Different cultivars vary in their susceptibility to boron deficiency.